There are many different frame styles, shapes and sizes. Our trained opticians are here to guide you in not only selecting a frame that’s attractive, but one that will work well for your prescription. 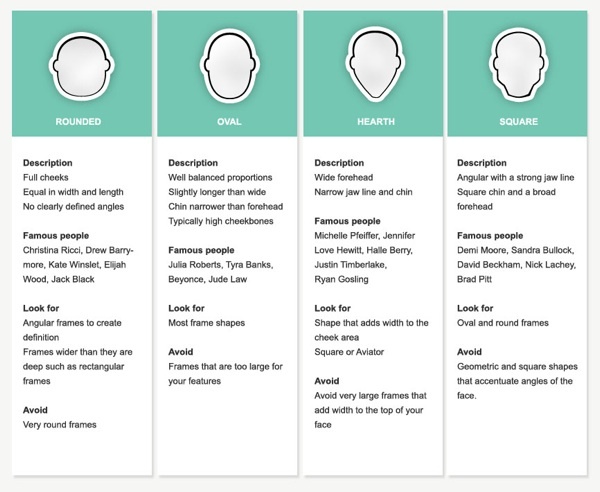 We’ve put together these guidelines to help you choose the most flattering frame shape for your facial features. Certain frame shapes will balance and complement your facial features. While others can result in an unattractive, awkward look. Regardless of the style of the frame, your eyes should be as centered within the lens openings as possible. This gets you the best optics, the thinnest lenses and the best cosmetic appearance. The frame should be wide enough so that there is a slight clearance between the frame temples and the sides of your head. A frame that is too wide will constantly slide down. A frame that is too tight will pinch your head and lead to discomfort. The top of the frame should approximately follow your brow. The frame should not be noticeably higher than your brow line. The size and thickness of your eyeglasses should be in proportion to your body size and weight. If you have a slim or petite build, You should choose a thinner more delicate frame for a balanced look. Fashion will sometimes trump this rule. By using the chart below you can determine your face shape and the frame shapes that will best compliment your facial features. For the most flattering look, you should select a frame shape opposite your face shape. The color of your eyeglass frames should complement your skin tone. A warm skin tone has a bronze, golden or peaches and cream cast. A cool skin tone has blue or pink undertones. These guidelines will help you choose a frame that will enhance your appearance, but sometimes you may want to intentionally ignore some of these rules for a more dramatic look.